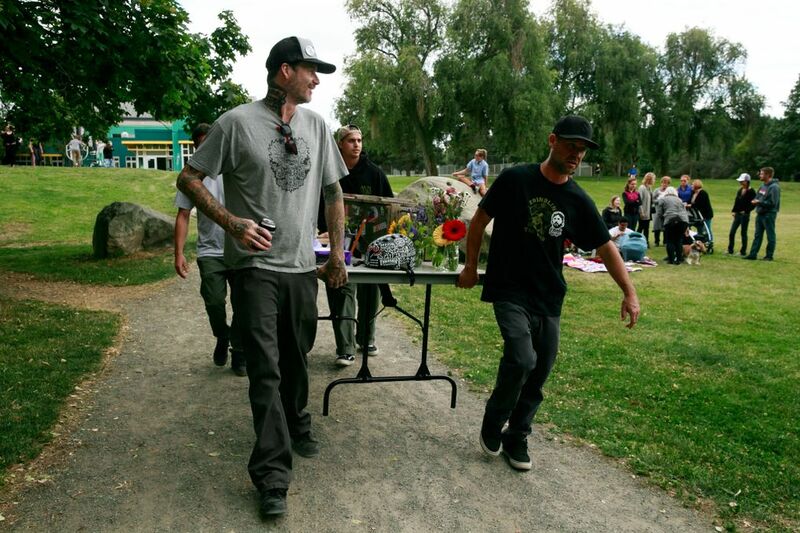 Grindline Skateparks lost its longtime leader when Mark “Monk” Hubbard died in June. 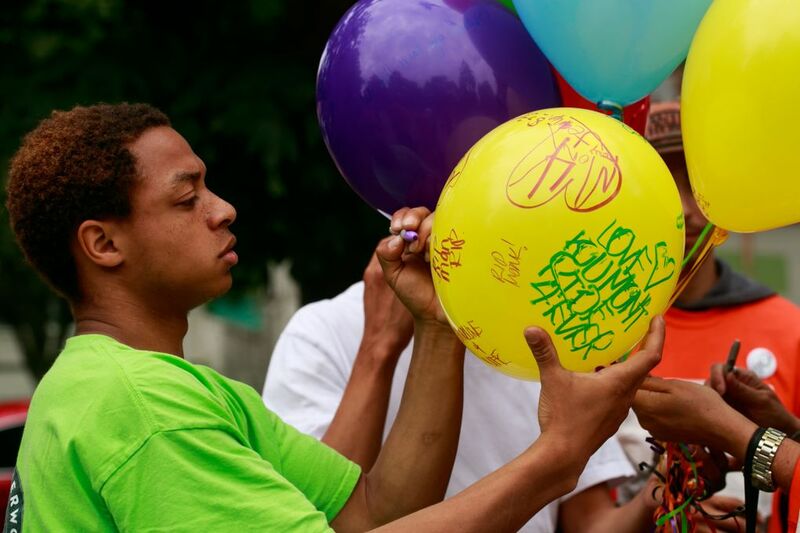 But the company continues his work of building skateparks in communities across the country, a vision that grew out of the skateboarding experiences he and friends shared as youngsters. 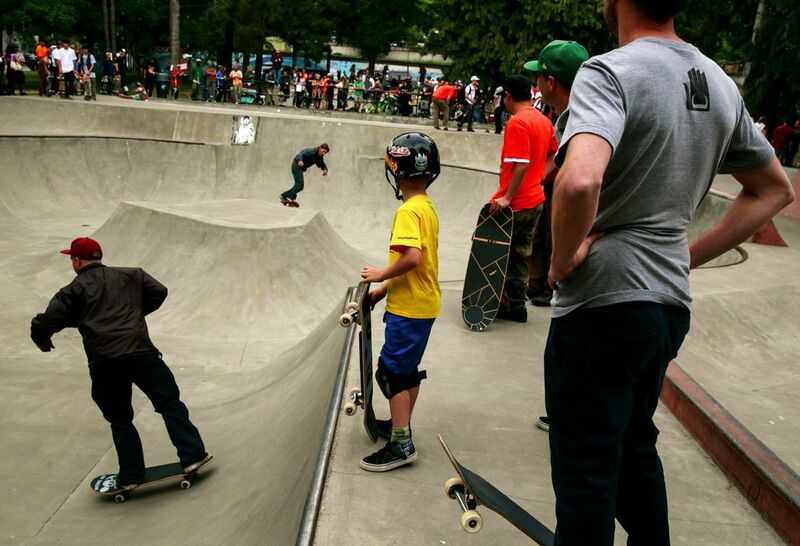 The whir of rolling urethane wheels filled the air as dozens of skateboarders traversed the smooth concrete at Delridge Skatepark. 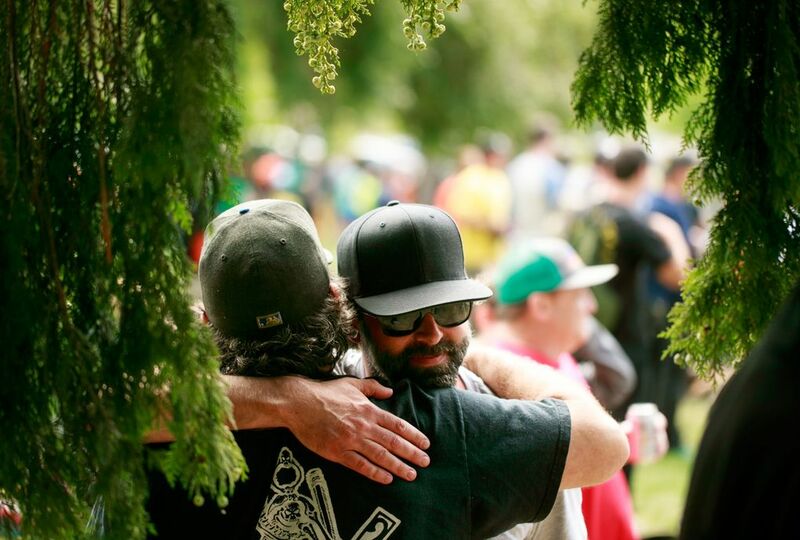 Hundreds had gathered for a celebration of Mark “Monk” Hubbard, president and founder of Grindline Skateparks in Southwest Seattle, who was found dead in his home two weeks earlier at age 47. Under Hubbard’s leadership, the 32-employee company designed or built more than 400 skateparks in the U.S. and elsewhere, but now it faced the reality of moving forward without the visionary who started it. 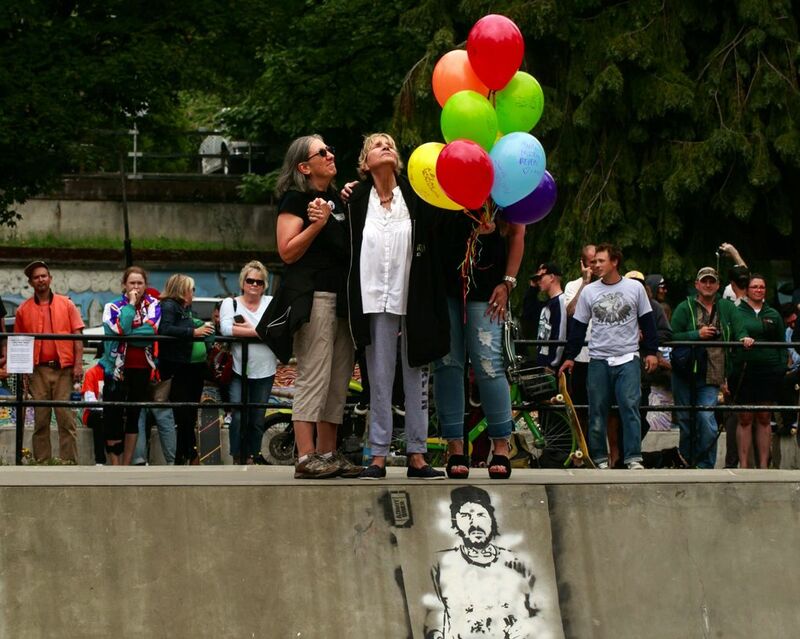 There were no speeches or formalities at Delridge, aside from one moment of silence when Hubbard’s mother, Becky Hernandez, released balloons as she stood above a portrait of her son painted on one of the park’s concrete walls. The gathering, on the afternoon of June 22, was more like a party — just the way Mark would have wanted it, his friends said. 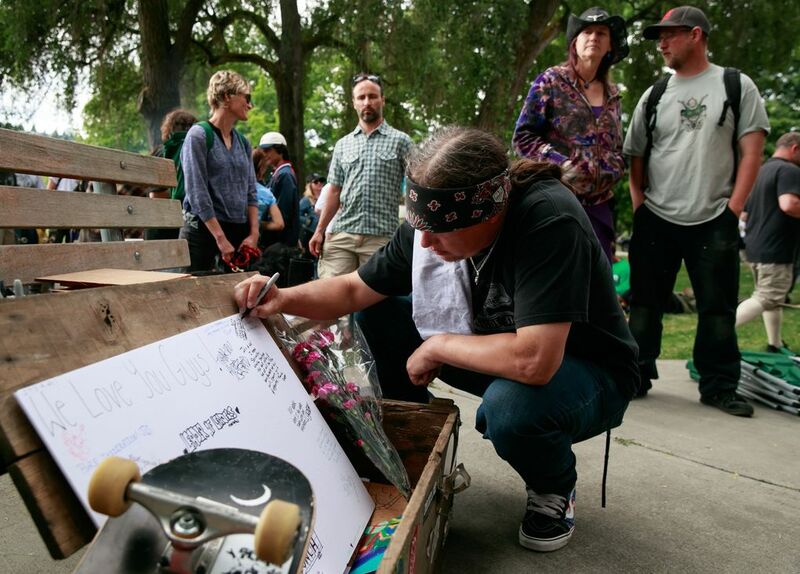 There was plenty of skating and laughter and some tears as fellow skaters joined family and friends in sharing memories of a man whom many considered a pioneer in skatepark design and construction. Skaters of all ages crowded, shoulder to shoulder, around the park’s concrete bowl, each waiting for an opportunity to drop in and carve its concave walls. 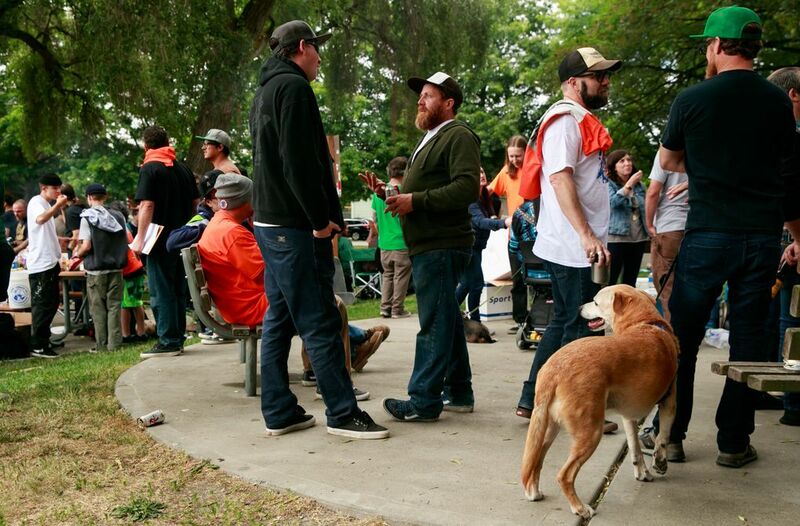 Among them was Grindline Skateparks co-founder and senior site superintendent Dave “Shaggy” Palmer, with a bright white T-shirt and bushy red beard, who was overseeing a project in Texas when he heard the news of Hubbard’s death. Grindline flew its entire staff, many at work on parks in Oklahoma and Utah as well as Texas, back to Seattle for the memorial at Delridge, a park the company designed and built in 2011. While Hubbard had no longer been involved in the day-to-day business operations, Giaquinta wanted to quickly reassure the company’s employees. “They needed to know that just because Mark was gone, that didn’t mean that their role in this company was coming to an end,” Giaquinta said. To discuss the company’s path forward, she scheduled a meeting the following week at Grindline’s headquarters in Delridge, in the neighborhood where Hubbard lived with his wife, Jennifer Rosholt, and their three children. The company’s remaining five owners, along with lead designer Micah Shapiro, met in a room surrounded by shelves filled with black binders, one for each of Grindline’s projects: 81 in Washington state, and others spanning the globe from Sitka, Alaska, to Copenhagen, Denmark, to Herzliya, Israel. There was no question that they would continue the business with Hubbard’s vision and philosophy as a guide, said Matt Fluegge, Grindline’s senior project manager. The group unanimously named Palmer as the company’s new president, a position he didn’t ask for and was at first reluctant to take. As one of the original founders, Palmer was there some 30 years ago when Hubbard’s vision for Grindline took shape. In 1987, 17-year-old Mark Hubbard hopped a freight train, leaving his hometown of Seattle with little more than a skateboard in hand. He was on a mission to skate the handful of parks that dotted the U.S. at the time. Palmer remembers Hubbard rolling into Phoenix — the city was a popular destination for skaters in those years, thanks to the vast array of empty pools scattered around the desert — talking about how he was going to build the biggest concrete skate bowl in the world. 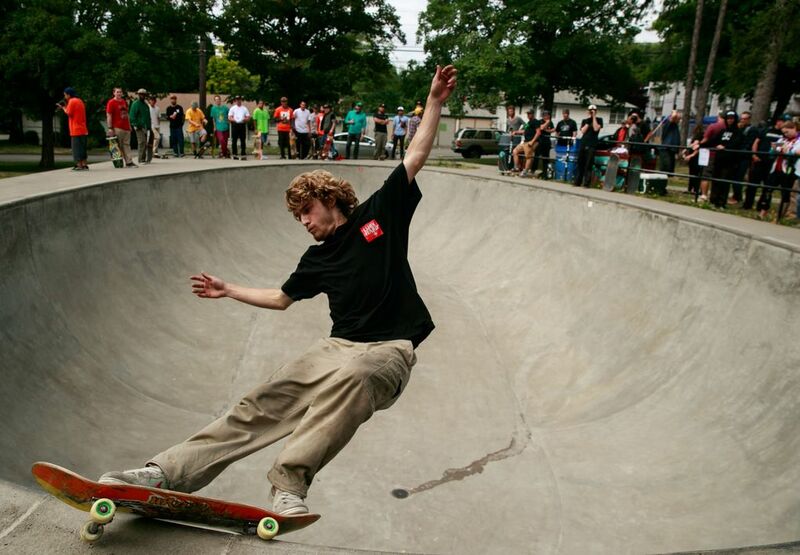 Grindline Skateparks has a web site with photos and maps of its projects. Many are in the Seattle area. Palmer thought Hubbard was crazy at the time. Yet, almost three decades later, together at Grindline they would build North Houston Skatepark, the largest of its kind in North America and third largest skatepark in the world. Hubbard eventually circled the country three times, hopping freights along the way, and the people and moments he encountered on that journey would plant a seed that would one day become Grindline. Hubbard recounted those days in a long text to Giaquinta in February — he’d talked of maybe writing about it for Thrasher Magazine. He wrote that he’d had an epiphany after being kicked out of a park in Florida, “due to lack of funds, deeming it necessary to jump the fence to get my rides in.” The few parks available in those years charged entrance fees. After making his way back to the Northwest, Hubbard in 1990 began working with a handful of other skaters to construct the legendary Burnside Skatepark under Portland’s Burnside Bridge. It began as an unsanctioned project led by the skater community and Mark “Red” Scott, who would later found the design-and-build firm Dreamland Skateparks. But Burnside became a success story of urban renewal that was eventually backed by the city and local businesses, and it influenced an entire generation of DIY skatepark builders. Inspired by Burnside, Hubbard and his friends started illegally digging a bowl under the Schmitz Park Bridge in Seattle in 1991. 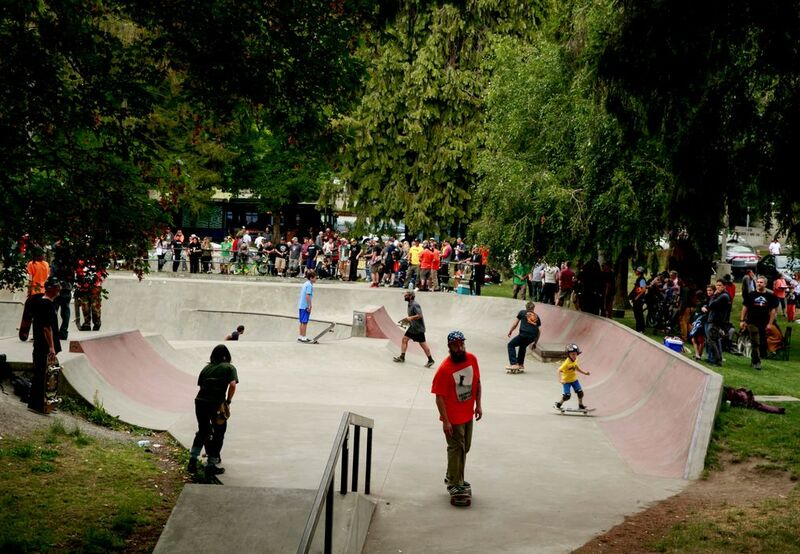 While that project was eventually shut down by the city, it prompted the creation of the famous West Seattle Bowl, one of many concrete bowls Hubbard and his friends would build in backyards throughout the ’90s. 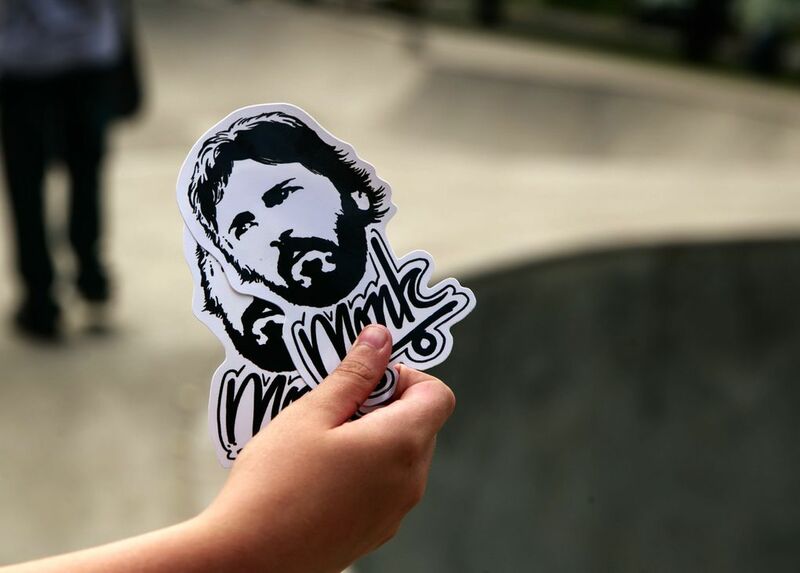 It wasn’t until an encounter in 2002 with legendary ski-film creator Warren Miller that Grindline Skateparks would be incorporated. 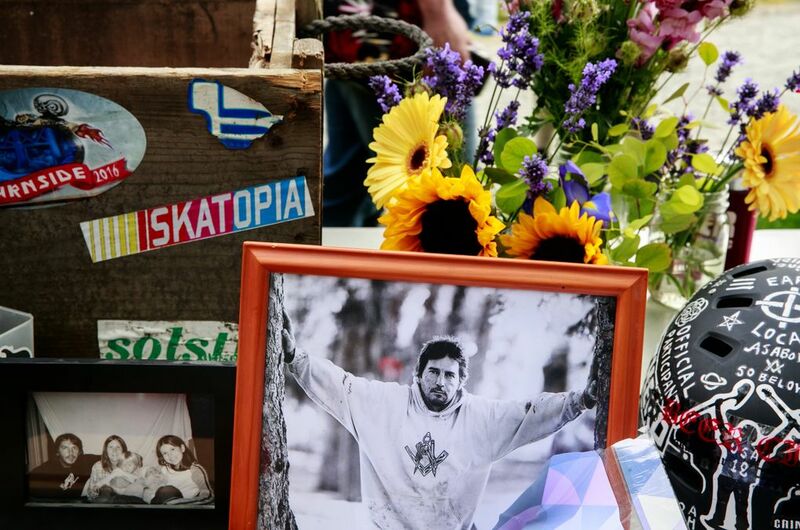 Miller helped lead an effort that year to build a skatepark on Orcas Island, where he lived before his death in January. In his syndicated column, Warren’s World, in 2010, Miller wrote of meeting Hubbard while interviewing potential builders for the project. Hubbard arrived “still covered in concrete from troweling cement all day,” Miller wrote. Palmer said Grindline initially wasn’t about making money or even expanding a successful business. It was all about skateboarding and building the types of concrete playgrounds Hubbard and his friends wanted to skate. That willingness to blow budgets contributed to financial difficulties in the early years. When Giaquinta was hired in 2003, Grindline was broke and on the verge of bankruptcy. The reckless abandon with which Hubbard’s team approached each project had an upside, however. 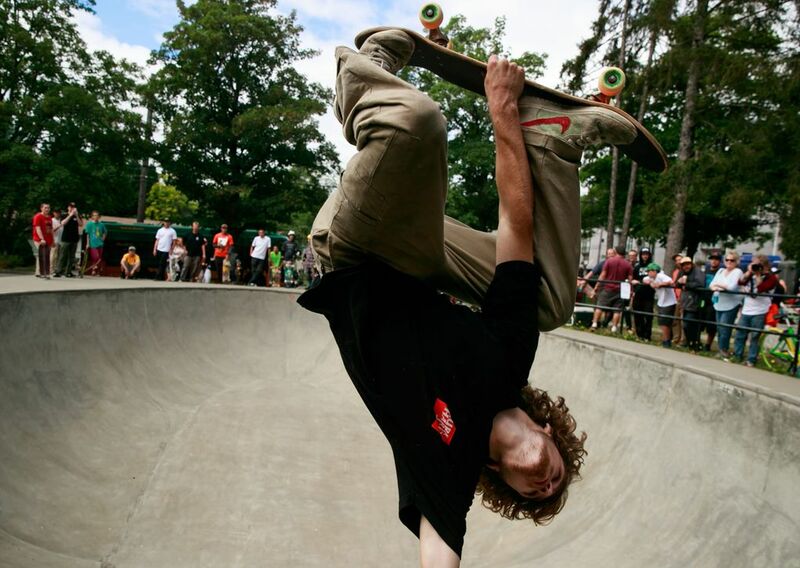 It garnered respect and praise from the skateboarding communities they built for, as well as a steady stream of referral business as an increasing number of cities were under pressure to provide dedicated skateparks. Grindline has since found solid ground financially, thanks to a dedicated team that has been able to harness Hubbard’s passion and vision. 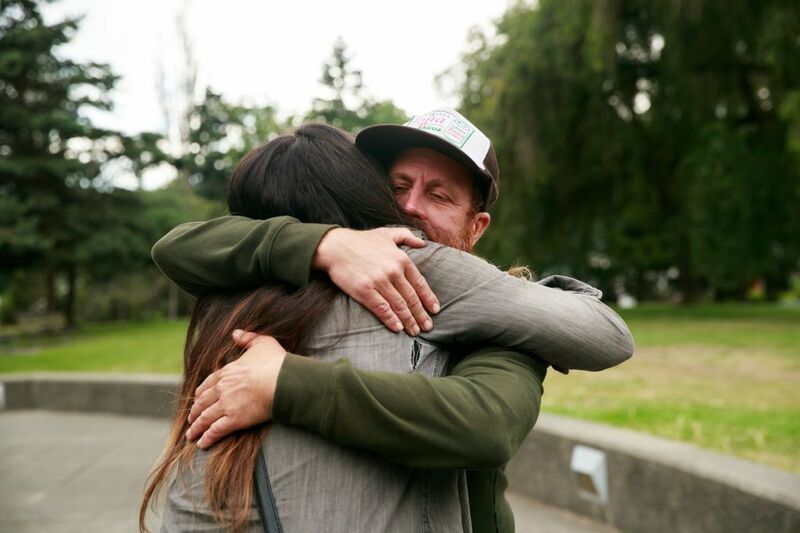 For design projects, lead designer Shapiro, who grew up skateboarding in Seattle and used to manage a team of professional skateboarders, meets with local skaters to discuss their needs and expectations. The company employs its own concrete craftsmen, all of them skateboarders, who travel from site to site. With 26 projects in 2018, Grindline has already filled its construction calendar for the year and is projected to do $5.2 million in revenue. Company executives talk of possibly expanding the staff to meet cities’ growing demand for skateparks and other types of action sports venues. Hubbard’s company has influenced a generation of skaters around the world. Shapiro said the proliferation of skateparks over the past 18 years has contributed to the development of a new breed of skateboarders. “The average kid today is as good as a professional skateboarder in the mid-90s, because they have these skateparks to skate on,” he said. As the sun was setting that evening in June, the skate session continued, along with the music and stories about Hubbard. 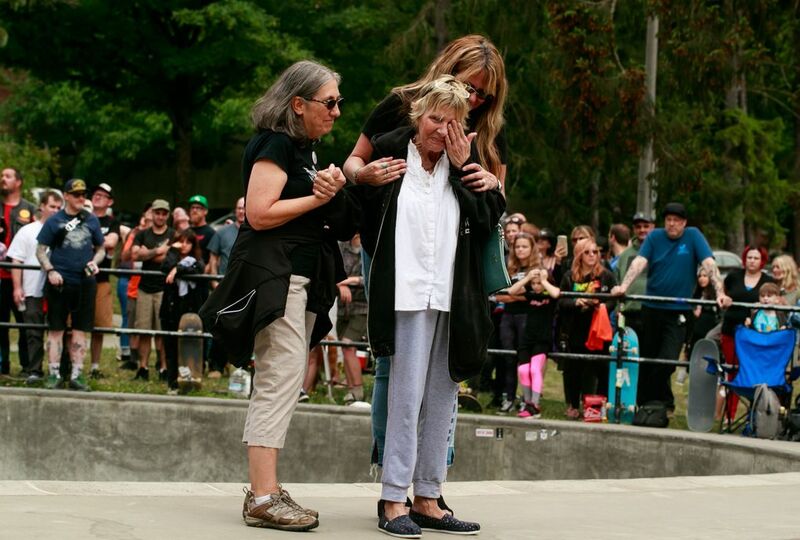 Hubbard’s fervor for skateboarding was rooted in moments like these. It was his friends and the communities he built for that motivated him, said his wife, Jennifer.